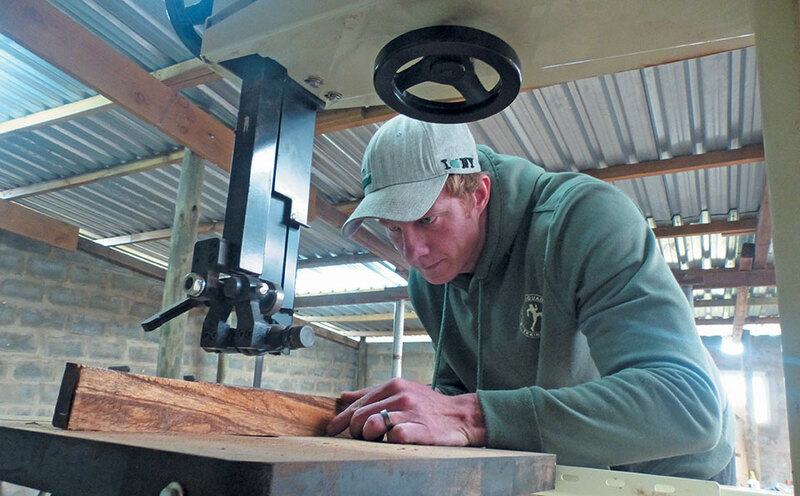 Based in the Eastern Cape, Warrick Harvey has rapidly built an international reputation as a crafter of exceptional bows. Mike Burgess spoke to him about his life-long love of archery. 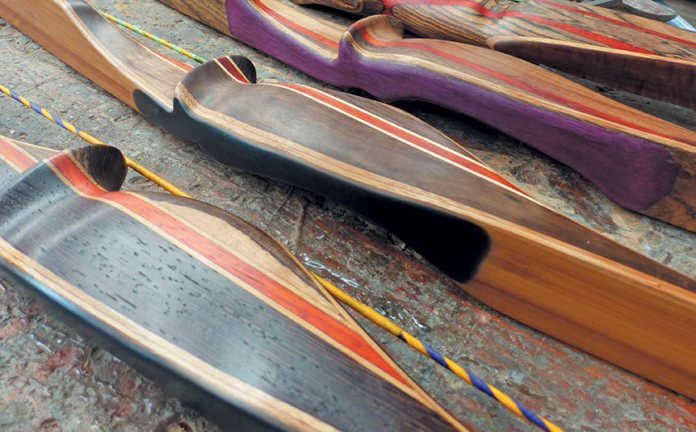 The intricate handles of some Harvey long and recurve bows. Matching the limb veneers up with the handles is an important component of bow crafting, says Warrick. You have to be obsessed if you want to craft bows, says Warrick Harvey (28) in his workshop on the family farm Tuli Circle near East London. “I think day and night about how I can improve my bows,” he adds. His infatuation with archery began as a child and, although he grew up to become a commercial diver, his love of bows still defines him. In fact, he devotes almost all his time producing bows when not diving as far off as the Americas and the Middle East. “I’ve made about 70 bows since my last diving job in the Bering Sea in December,’’ he says. Warrick was four when he was given his first bow, but when one of his rubber-tipped arrows struck his mom, Robin, between the eyes the bow was confiscated. Distraught, he attempted to produce his own from sticks in the garden. In 2006, he crafted his first laminated bow which he sold to a friend. This was followed by more, for which he found a surprisingly ready market. By 2015 he had enough tools, machinery, skills and, most importantly, confidence to launch Harvey Archery. Warrick uses a bandsaw to cut limb veneers. A key lesson he’s learnt over the years is that employing a drum sander, as opposed to a thickness planer, to finish of laminates is non-negotiable. ‘A planer smooths the laminates and veneers too much, while a drum sander leaves them scratched so the epoxy can set effectively,’ he explains. Today he produces bows for clients in South Africa, Namibia, Botswana, the US, the UK and the Far East. Most are hunters and archers – including British National Archery champion Wolfie Hughes – but a number buy Warrick’s his bows simply because of their beauty. For example, Chris Erasmus, owner of the acclaimed restaurant Foliage in Franschhoek, has purchased 14 Harvey bows to decorate his eatery, while a lodge in the Kruger National Park has also ordered a consignment. But then Warrick has always been aware of the importance of marketing his bows as ‘functional works of art’ that double as weapons (or vice versa). This is very evident on his Facebook page and in his well-produced YouTube videos, which have proved crucial in giving his business a global reach. bow makers, who still practised his trade in the early 1900s. His recurves are marketed under a number of catchy names, such as ‘Honeybadger’ and ‘Bushwalker’. Warrick also advertises his bows in specialist magazines and exhibits at expos such as Huntex. However, he reckons one’s reputation as a bow crafter will always be the most effective form of marketing. Warrick crafts longbows (with unstrung lengths of 64’’ [1 626mm]) and recurve bows (with unstrung lengths of 56’’ [1 422mm] and 58’’ [1 473mm]) in one piece and in takedown versions, which allow an archer to detach and replace limbs. Harvey bows predominantly range between 35lb and 60lb (16kg and 27kg) and have undergone numerous improvements and tweaks over the years. For example, the current Ishi longbow is the fourth of its type. “It’s been significantly improved,’’ says Warrick. Harvey bows are produced from an array of materials sourced from across the globe. The action bamboo used in bow limb cores comes from China; the uni-directional fibreglass used on the back and the belly of the bows comes from Germany; the industrial epoxy used for gluing the laminates, veneers, handle block, tips and handle overlays comes from the US. Wood, the central ingredient of all Warrick’s bows, is sourced from Knysna Rare Woods, which purchases timber from across the world. Some of Warrick’s favourites include African padauk, Brazilian lacewood, zebrawood, maple, walnut and teak. Warrick also plans to utilise local wild olive wood which Xhosa craftsman like to use for knobkierries because of its exceptional durability. Bone, horn and ivory from warthog, giraffe, zebra, impala and other game relatively easily sourced in the Eastern Cape, thanks to a vibrant game industry, is used for tips and handle overlays. Some discerning customers are very specific about what materials are to be used in their bows. A favourite for tips and handle overlays is bushbuck horn, while on occasion clients will supply an out-of-the-ordinary material such as mammoth ivory. One of the first steps in the production of a Harvey bow is cutting limb veneers from selected wood and trimming them down to 0,3mm on a drum sander. Limb veneers are added mainly for their aesthetic qualities, but laminates give the bow its power. Producing these tapered laminates can be rather mathematically challenging, says Warrick. In its raw form a handle consists of a block of glued segments of wood including thin strips called accents. The handle shape is traced onto the handle block and carefully cut out with a band saw before being sanded to match a wooden mould used in the curing process. In the case of one piece bows the laminates (thin at the tips, thicker in the centre), veneers and two outer strips of uni-directional fibreglass are carefully glued together with industrial epoxy before being shaped around the handle. The limbs are then covered with a veneer and taped together to ensure that the various layers of bamboo, wood and glass don’t move. The now integrated bow is placed into a mould with a piece of fireman’s hose that is pumped to 4,5 bars to ensure that equal pressure is applied to the entire length of the weapon when cured in a wooden heat box. After 24 hours in the heat box the bow is removed and allowed to cool before being sanded to remove residue epoxy. Then a trace of the exact limb shape is made on the limbs and carefully cut out with a jigsaw. The limbs are sanded before the tips and handle overlays are glued on and left to cure overnight. The next day the arrow rest and grip are marked up and cut out before being shaped with a spindle sander. With the weapon practically complete, the bow string nocks are hand-shaped and the limb covering removed to expose the veneers. The bow is then strung and a poundage test is done. The finishing touches to a Harvey bow include obsessive sanding, the placing of the Harvey Archery logo in the handle and, eventually, applying a wood sealer. Next, the client’s name and the bow’s technical details are added with a paint pen before a clear lacquer sealer spray is applied. On average it takes Warrick 50 hours to produce a bow, a period in which patience serves as the only safeguard against mistakes that often demand starting the entire crafting process over again. Phone Warrick on 078 114 0002, or email [email protected]. Facebook page: Harvey Archery.